It was 16 years ago now that I was at Waverley Park for a Round 10 night game between Essendon and St Kilda. The game was quite uneventful, with the Bombers holding a pretty comfortable 20 point lead late in the third quarter. All things being equal, even without the great James Hird, we’d take out the W and live to fight another day. And then something happened that hasn’t occurred before and probably won’t again. I distinctly remember standing and cheering at this unbelievable event. You think that when you go to a footy game, you’ve seen it all. And to a degree, you have. You know all the rituals – getting to the game early, where you like to sit, reading the paper or footy record, grabbing your pie, watching the ebbs and flows of the game. You don’t know the result but for the most part, you do know what to expect. So an unexpected blackout was cause for celebration. It didn’t take long for the tone of the crowd to change. Cheering and celebration turned to impatient murmurings, which turned to a field invasion, which turned to fires being lit on the field, which turned to point posts being uprooted. I grabbed my friend and quickly headed for the exit. On the weekend, a very serious scenario unfolded. 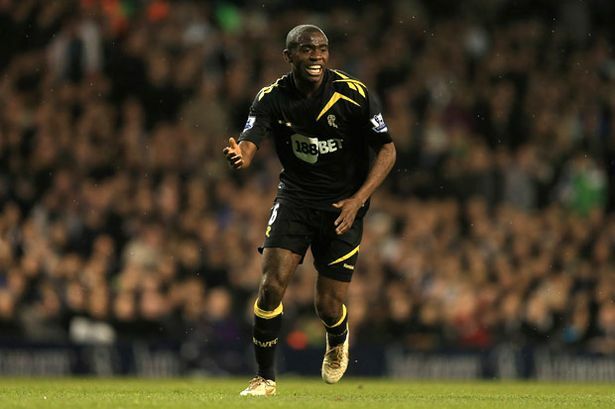 In a FA Cup match against Tottenham, Bolton midfielder Fabrice Muamba went down behind play. There was no foul play and no opposition player slinking away guiltily. Play was stopped as some of the best medical personnel in the country rushed to his aid. And then the defibrillators came out. I sat my annual First Aid refresher last week. The stats relating to defibs are off the charts. You have less than a 10% chance of reviving someone who falls unconscious from a heart attack. You add a defib to the mix and your success rate rises to over 70%. Back at the game, the medicos worked on Muamba for 10 minutes before stretchering him off, unconscious and in a serious condition. English soccer fans know the ins and outs of their game better than most. You think AFL fans are obsessed!? These guys take things to a whole new level. 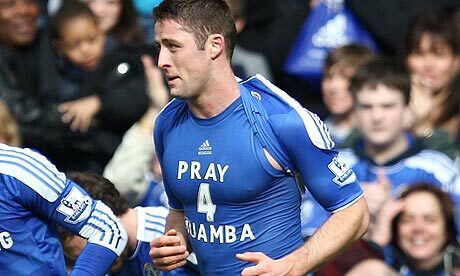 They also have entrenched rituals, with non-stop songs and chants and specific taunts of opposition teams and players. Australian fans will never forget the atmosphere throughout the game when we defeated Uruguay on penalties to qualify for the 2006 World Cup. It was incredible. English crowds are like this every week! So, the response from the Tottenham crowd was telling. Scepticism hastily became genuine concern as they saw the shocked responses from players from both teams. Opposition players were hugging, some in tears, some openly praying. 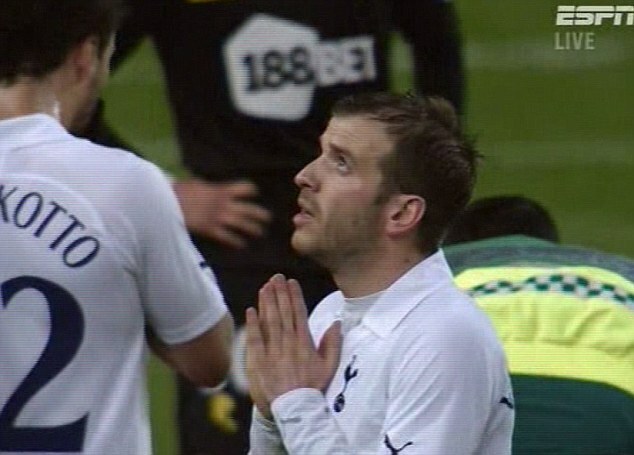 Rafael van der Vaart praying for Muamba as the scene unfolds behind him. For many of them, the memory of Marc Vivien-Foe, the Cameroon midfielder who died on the pitch in 2003, was still too vivid. To be in a large crowd that is completely noiseless is eerie. I have been to a number of Anzac Day games between Essendon and Collingwood. The ‘minute’ of silence to honour the fallen before the game begins can be disconcerting. For soccer fans at the stadium who had ‘seen it all before’, the thrill of competition and ‘dislike’ for opposition players and fans immediately dissipated. The unnerving silence was broken in the most inspiring of ways. A chant for Muamba broke out. Fans of both teams raised their voices as one as the Zaire midfielder whose heart would apparently not be re-started for another 90 minutes, was carried lifeless from the pitch. The game was called off. For a sport and a country in which such an act could inspire a riot, they were, not surprisingly, compliant. Sport’s place in all things was given a jarring dose of perspective on the weekend. A person’s life was and is at stake, and a section of the sporting world had an opportunity to put its best foot forward. Of course it did so with genuine care, concern and love. I wish it wouldn’t happen like this, but there’s something special when a community comes together with such passion. On your feet, Fabrice. We’re all with you. 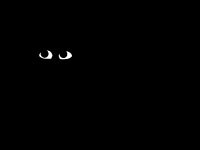 Posted in Sport and tagged 12 months off sport, Bolton, collapse, Essendon St Kilda blackout 1996, FA Cup, fabrice muamba, my year without sport, no sport, Rafael van der Vaart, Tottenham, year without sport. Bookmark the permalink.